TJ's Seek and Find is currently free, and is a lovely simple puzzle app for children around 6 and under. TJ’s SEEK & FIND adds two unique challenges, and an animated reward, to the classic Seek and Find game of finding the hidden objects in a picture. Great pictures! Great fun! 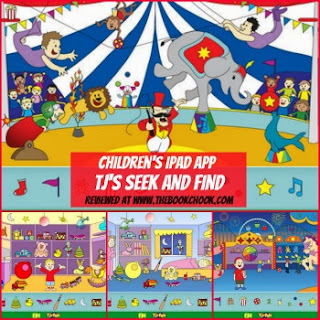 TJ’s Seek & Find includes a fun, ANIMATED, INSTRUCTIONAL VIDEO. the screen and then drag the objects into their matching shapes. - Once you’ve found all the objects, the picture changes to a new black & white picture. - The second challenge is to drag the objects you just found and place them in the new picture. - Once you’ve completed both challenges, the picture comes to life in FULL-COLOR ANIMATION. TJ's Seek and Find is not so difficult as to frustrate pre-schoolers, but they do need to search and concentrate to find pictures that match the silhouettes. It has two colourful scenes - Circus and Toy Shop. Once kids find the object they want, they drag it to its silhouette, and it snaps into place if correct. When all the small objects have been found, the scene changes to a different one in black and white, and kids must add their coloured objects to it. After both those parts are done, the new picture comes to life in colour and gentle animation. This is an excellent puzzle app for parents to play with their kids, encouraging them to talk about the objects, the shapes, and what might happen with our toys when we're asleep!